Welcome to #IceCreamWeek! Kim of Cravings of a Lunatic and Jen of Juanita’s Cocina have teamed up with more than 20 of their blog friends to bring you a week full of ice cream treats, including a special ice cream giveaway! Prepare to have your taste buds tempted with some of the best ice cream treats around! Today we are celebrating with a Birthday Ice Cream Party extravaganza for our friend Jen of Juanita's Cocina! We love Jen noodles and brunches! If you know Jen, then you probably adore her as well, so why not head on over to her website today to wish her the happiest of birthdays (or stop by her Facebook wall to wish her a Happy Birthday there). 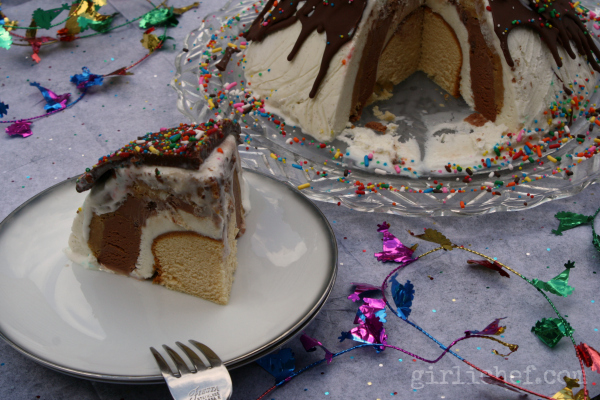 Oh hey, why not grab a slice of this over-the-top Birthday Bombe before you go? Doesn't it look insane? And totally worthy of a birthday celebration! And it is about 100x the size of the treat I originally intended to make for the party. It's true. I started out with the intention of making bonbons. I mean, a frosty glass bowl piled high with them...but still bonbons. I thought it would be simple. I mean, little nuggets of ice creamy goodness in any flavor under the sun. Right!? Wrong. Those buggers gave me a run for my money. Before catching up and overtaking me. It's really just a perfectionist sort of thing. I wanted 'em how I wanted 'em, and I wasn't settling for anything less. In my mind I pictured little domes. I thought maybe I could use a small scoop and then turn them out and freeze them. They didn't look pretty. Okay, fine. Next up, I dumped all the mini ice cubes form their (domed) tray and filled the holes with ice cream. Promising. Until I couldn't get them out. They were just too soft, and wouldn't hold their shape. What I need is a silicone mold that I can just turn inside out once they're frozen, but I wasn't going to be getting one in time. So, I scrapped those deformed little nuggets (right into the little baby bird mouths chirping at me from behind). I wanted festive. And apparently I wanted something dome-shaped, darn it all! So a giant, layered version was born. 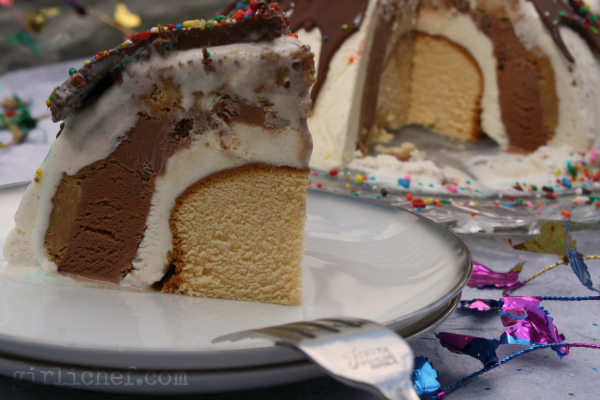 An ice cream BOMBE! Why yes, it is French in origin. Line a freezer-safe bowl (~1-1/2 quart size) with plastic wrap, leaving extra hanging over each end (to wrap back over). Scoop about 2-3 cups of vanilla bean ice cream into the lined bowl and press it against the sides and bottom, so that it is fairly even and about an inch or so thick. Gently fold in the plastic wrap and set a smaller bowl inside, pressing gently to "smooth out" the insides. Remove smaller bowl. Freeze for at least 2 hours. Place Nutter Butters and Peanut Butter sauce into a food processor and pulse until no large chunks remain, just small, wet crumbles. 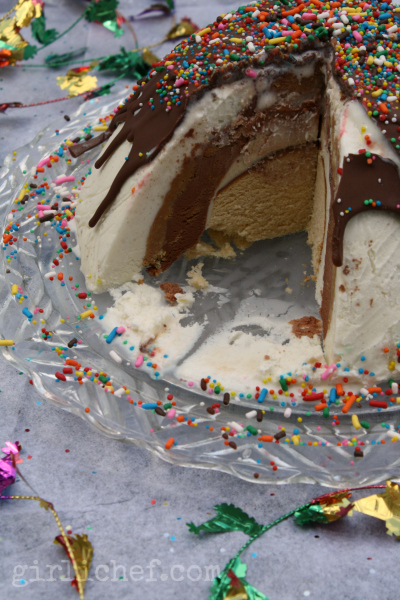 Remove plastic wrap from over the ice cream, and spread the Nutter Butter crunch in an even layer over the ice cream. Replace plastic and freeze for at least 2 hours. Peel back the plastic, and scoop 1-2 cups of Chocolate Peanut Butter Cup ice cream into the concave dome, pressing gently into sides and bottom, forming about a 1-inch layer. Loosely set plastic back over and press a smaller bowl in to "smooth out" the insides. Freezer for at least 2 hours. Peel back the plastic. Add another cup or so of vanilla bean ice cream to form a layer that is about 1/2-inch thick. Use a round cutter the size of your "center hole" to cut a circle from the pound cake. Gently, but firmly squeeze the pound cake into the opening. Put the plastic back over and freeze for at least 2 hours. When you put the bombe back into the freezer for the last time, combine the chocolate chips and coconut oil in a glass bowl and microwave for 1 minute. Stir until smooth, and then set aside and allow to cool to room temperature while the bombe is freezing. To finish it all up, peel back the plastic wrap and set a serving plate upside down over the bowl. Carefully turn the bomb over onto the plate, giving it a couple of good whacks on the counter to get it out of the bowl. Peel off the plastic wrap. Pour the chocolate mixture (cooled to room temperature) over the top of the bombe, allowing it to run down the sides. Give it a little help with the back of a spoon, if needed. 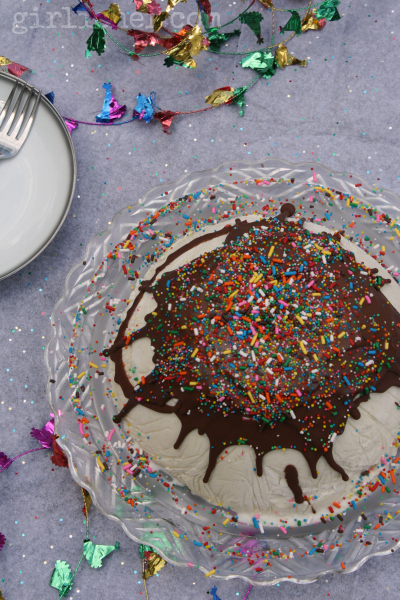 Immediately release a shower of sprinkles and/or jimmies over the top. If not serving immediately, place back into the freezer (cover with plastic once the chocolate shell has completely hardened, if you wish). To cut, run a long, sharp knife under hot water between slices. 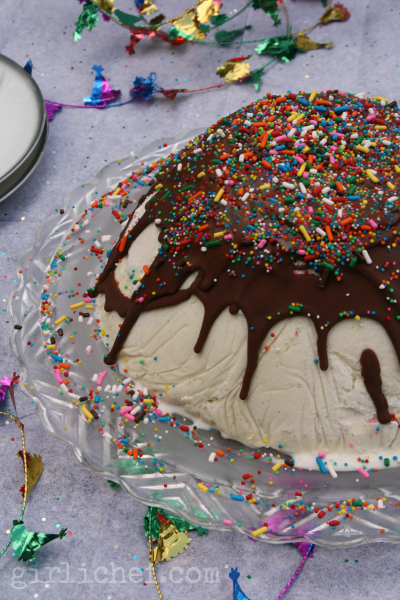 Switch this up with any type of ice cream or cake to make different variations. Use a jam layer or a chocolate crunch instead of peanut butter. Use white chocolate or dark chocolate instead of milk chocolate in the shell. The possibilities are endless! Please join us today, Saturday, August 17th at 2 p.m. (EST) for our PinChatLive Event happening simultaneously on Pinterest and Google+. We have ice cream cookbooks up for grabs. We also have 10 Ben & Jerry's Swag Prizes up for grabs. So check out our Pinterest Board, #IceCreamWeek during the event at 2 p.m. today to win one of these amazing prizes. We'll be announcing the winners of our giveaway and talking ice cream - see you at the Ice Cream Social!